Line chart series displays data points interconnected with lines. Markers with various shapes and fill options may be used for the single data point presentation. Nevron's graphics engine provides state-of-the-art image quality and legibility. Image effects such as shadow, glow, bevel/emboss and lighting make it possible to apply complex visual styles to any 2D scene. Smooth line charts display data points connected with cubic curves. Markers with various shapes and fill options may be used for each individual data point. XYZ mode allows presenting data series with non-regular distribution. 2D Step line chart with date-time X-axis. Step line chart series display data points connected with HV-segments. Markers with various shapes and fill options can be used for each individual data point. Stacked line series provides capability for presenting cumulative data. Line series may be displayed in the 3D space as a plane. Several line series may be arranged in the same depth space creating a set of overlapping planes. Positioned in different depth spaces, a larger amount of line series may be displayed at the same time, forming a more general impression of the overall relation between particular data series. XYZ Line Chart representing Lorenz Attractor – a complex fractal structure corresponding to the long-term behavior of a 3-dimensional dynamical system that exhibits chaotic flow and evolving without ever crossing itself. 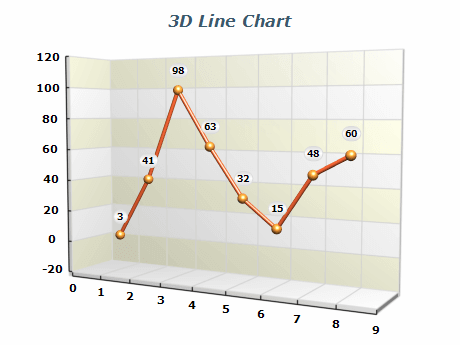 3D Step line chart with dimension scale X-axis. Step line chart series display data points connected with HV-segments. Markers with various shapes and fill options can be used for each individual data point.